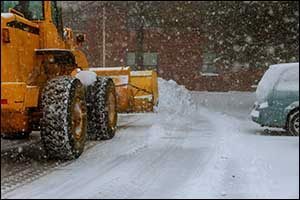 There are many different types of businesses in Rhode Island that could benefit from commercial snow removal. While you might think that you could stay on top of it yourself, all it takes is one really good snow storm to make you realize that you should have hired Rhode Island snow removal services before the season started. Snow removal services are the best way to reduce risks associated with liabilities caused by snow and ice hazards that can build up overnight on your commercial property. In fact, there are laws that require business owners to keep sidewalks, driveways, parking lots, and other areas clear of snow and ice to protect citizens, consumers, and other passersby. While you might be able to keep your storefront shoveled if you own a small business, but if your property includes parking lots, long walkways, and other surface areas, you really need snow removal in Providence to keep it clear. It can be difficult to charge your in-house maintenance crew with having to take on shoveling and de-icing duties in the winter. Not only does it keep them from the work that they were originally hired to do, but you will also need to purchase all of the equipment, safety gear, and provide training to ensure that everything gets done effectively and efficiently. Our Northern Rhode Island snow removal services can help to save you both time and money to ensure that your business complies with local snow removal requirements and stays open when your competitors are snowed in and closed. Whether you own or manage a retail shop, commercial property, shopping mall, strip mall, or office complex, Rhode Island snow removal services are essential. If possible, get a quote from a trusted and reliable service that has a solid reputation in the local region for providing quality services. You don’t want to get stuck in the middle of a storm and not know who to call. However, if your business is in the Northern Rhode Island area, you can count on Eastern Landscaping, Inc. to provide you with comprehensive snow removal services. We can help keep your parking lots and driveways clear of snow and ice during the winter months. Rely on our knowledge of the local, county, and state government regulations regarding snow and ice management to keep your property safe and compliant with legal requirements. The company that you hire for snow removal in Providence should be experienced and have all of the heavy-duty snow removal equipment required to get the job done quickly to provide professional results. At Eastern Landscaping, Inc. we offer all of the services you need for any type of service. We can provide sanding, shoveling, and commercial grade plowing services to get that snow and ice off of your property. Commercial snow removal is much different than snow shoveling, which leaves the snow in a pile on your property where it will eventually melt and cause damage to blacktop surfaces, sidewalks, and landscaping. Our team comes to your property to haul away the snow and de-ice your services in the Northern Rhode Island and Southern Massachusetts area, so it’s no longer a problem. We help you provide parking spaces for employees, customers, and other visitors to your property. We take the snow away, clear the driveways and walkways, and keep that snowy mess away from you and your customers. When you hire professional Rhode Island snow removal services, you take charge of the situation, doing everything possible to prevent accidents from occurring. All it takes is just one slip-and-fall accident on your sidewalk or in a parking area to wake you up to the liabilities associated with commercial property ownership and management. Prevent that from happening to you and your business by hiring our team to provide a safe solution that will keep your sidewalks, driveways, and other surfaces completely free of snow and ice. While it is currently the busy season, it’s never too late to ask for help. Contact our Northern Rhode Island snow removal services by calling 401-766-9035 to get a FREE estimate for our services. We provide a wide range of commercial property services year-round, including landscape design, installation, and management, as well as hardscaping design and construction. Call today and learn more about all of the ways that Eastern Landscaping, Inc. can help you keep your business safe and looking great all year long.